Why wait for a knight in shining armor to deposit a ring on your finger when you can get one for yourself? 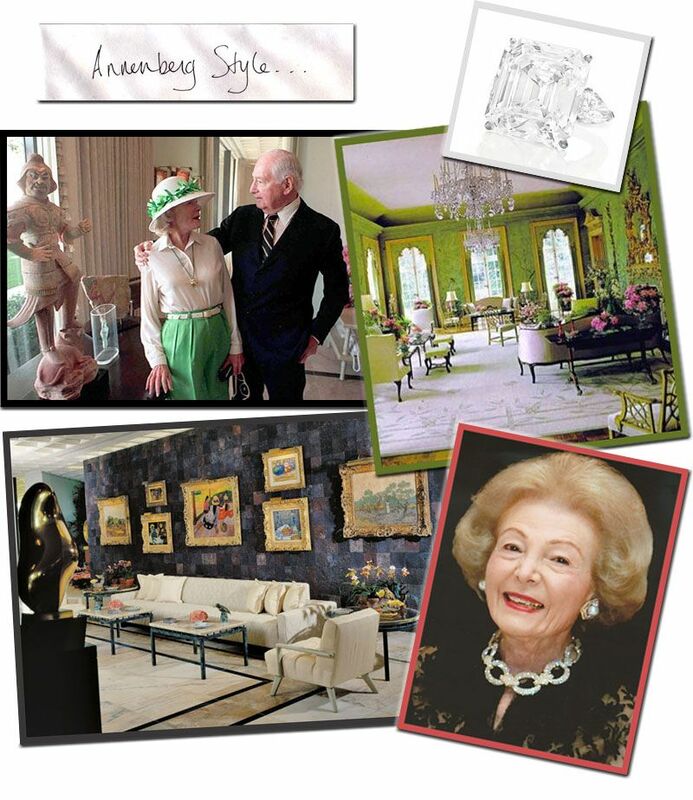 Just follow the lead of Leonore Annenberg (1918-2009), the billionaire philanthropist/ former Chief of Protocol and wife of businessman/ambassador to the UK, Walter Annenberg (1908-2002). You've gotta love a 90 year old woman whose birthday gift to herself was... a 32 carat D-flawless diamond boulder. The diamond went up for sale at Christie's two days ago (21st Oct), and sold for a record 7.7 million dollars to an anonymous buyer. Above, Leonore Annenberg with her husband Walter, the 32 kt. diamond auctioned at Christie's, a green room from Annenberg's Winfield House, blue room from the Annenberg estate Rancho Mirage, California (image from Vanityfair.com). The key ingredients are first of all to have interesting people...Then you try to put together an ambience of good food and attractive table settings. But all of that would be unimportant if you didn’t have interesting people. on the Rancho Mirage residence available for preorder, pub. on Nov 12 (Here: Sunnylands: Art and Architecture of the Annenberg Estate in Rancho Mirage, California). Anyone hear anything about it? Preorder? Yes/no? Love her green room. Exquisite. Is the 32 kt around her neck? It looks a $7.7 million gumball! Love the spirit. I just turned 60 and have 30 years to get a 32 kt. bd present. Home- Even better, it's a RING! ArchitectDesign- Thank you for the recommendation! The Annenberg Collection was one of the first exhibitions I ever saw at the National Gallery. Just amazing!